Today’s Coffee Spot was another chance discovery, following on from last week’s unexpected finds during my recent trip to Shanghai. Whereas Seesaw and Mellower Coffee were names I already knew, The Point, in the ancient Water Town of Zhujiajiao, was an unknown quantity. 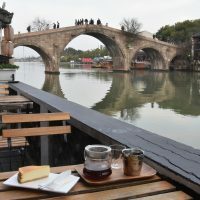 Visiting Zhujiajiao purely as a tourist, drawn by its narrow, winding alleys, canals, and old, stone bridges, coffee was not high on my list. Indeed, before I left, I’d filled up my Travel Press, bringing it with me so that I’d be sure of one decent coffee during the day. However, as I wandered the narrow lanes, practically every café/restaurant was offering coffee (and practically every other shop was a café/restaurant). Most looked unimpressive, several were interesting, but only one leapt out at me: The Point. The roaster standing proudly at the front of the counter was a clear statement, one which, I discovered, was backed up by some excellent coffee. It’s also an excellent place to drink said coffee. Long and thin, it’s comprised of multiple, small rooms running back from the street, ending in a lovely terrace overlooking the Dianpu River. Even better, it’s spread over three floors, each successively smaller as you go up. Zhujiajiao, on Shanghai’s western fringes, is around 1,700 years old and is easily accessible via the newly-constructed metro Line 17. The Point, which opened in 2011, is on Dongjing Street, one of the main tourist routes along the northern bank of the Dianpu River, just west of the famous Fangsheng Bridge. The narrow shop front, concealed at night by a full-width, roll-down shutter, houses a slightly recessed counter on the left, with a narrow corridor on the right, leading past the counter into the interior. It would have been fairly anonymous were it not for the small roaster standing before the counter on the left. Drawn in, I found other promising signs. The menu, on the right-hand wall, had a fairly standard offering, but the row of V60s on the front of the counter, hinted at more. Then there were the two espresso machines, a seldom-used Nuova Simonelli Oscar and something of less obvious provenance, looking like a Rocket machine with a Slayer group head. There are three stools along the side of the counter, where you can sit, chatting with the barista and watching coffee being made. Normally, I’d say go for it, but you’d be missing out. Heading further back, past the cakes, you come to a narrow corridor running along The Pont’s right-hand side. This leads past a cosy, self-contained sitting room with a single table, into a larger, lounge-style room, with an L-shaped bench along the front and left-hand walls, complete with two tables, each with a comfy chair. At the back, stairs lead up on the right, while on the left, past some bookshelves, a doorway leads to a third room. This has another L-shaped bench, this time along the front and right-hand walls, with three, rather than two, tables. Best of all, three pairs of narrow wooden doors open onto a small terrace overlooking the river. This is also L-shaped, with a two-person table around the corner and two more next to the water, offering great views of the five stone arches of Fangsheng Bridge. Upstairs are two more floors, the first with two medium-sized rooms front and back. The back room has a pair of tables, a sofa and four chairs, while the front room has a larger sofa and boat-shaped coffee table. Finally, the top floor has a smaller room at the back, a single, two-person table by the solitary window overlooking the river. Meanwhile the front has a sofa and three round, wicker chairs, all surrounding a small coffee table. Turning to the coffee, The Point has a blend and single-origin on espresso, with four more single-origins on pour-over, all roasted on-site using the roaster out front (the blend is roasted off-site on a larger machine). When I asked about Yunnan coffee, which I couldn’t see on the list, a bag magically appeared from under the counter. It looked so lightly-roasted that I wondered if they were green beans, but when the barista poured some into bowl, I could see that it was a light roast, easily the lightest I’ve seen in China. I tried it as a V60, which was beautifully presented in a carafe with a glass on the side. This, along with a metal beaker of water, was brought out to my terrace-seat on a lovely wooden tray. The coffee itself had an interesting taste, with an undercurrent of something I couldn’t put my finger on. I enjoyed it, but wondered if it might be slightly under-developed. I paired this is a very fine slice of a rich, crumbly, New York style cheesecake that rounded things off perfectly. This entry was posted in Cafe/Roaster, Cake, Coffee Shops, Coffee Terraces, Laptop Friendly, Shanghai and tagged AroundTheWorld2019, include, The Point by Brian Williams. Bookmark the permalink.